Are You Making These 5 Cat Training Mistakes? 5 Cat Training Mistakes: Guilty of Any? 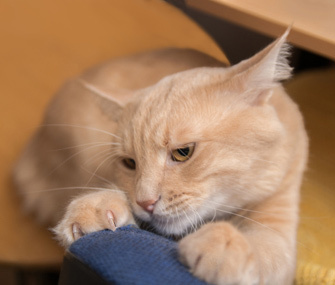 Instead of reacting to your cat's behaviors, such as scratching furniture, ignore or redirect the unwanted behavior and reward his good behaviors. Training a cat might sound impossible, but it’s not — cats are smart, and with the right approach you can frequently channel their intelligence in productive ways. Training a cat often seems harder than it really is, particularly if small missteps are hindering success. As a trainer, I see cat owners make the same training mistakes over and over. Let’s talk about how to avoid five common errors and get your cat’s training back on track. 1. Overestimating how much time training takes. Many cat owners assume that training a feline takes a significant amount of time and effort. The reality is that cats learn best in short training sessions, typically one to five minutes, spread out through the day. There’s also no need to schedule specific blocks of time to train your cat; instead, make use of small windows of downtime — while you’re waiting for the coffee to brew, for example, or for the kids to brush their teeth — to work with your cat. Finally, training is typically most successful when it is incorporated into already existing everyday interactions like mealtime. 2. Ignoring the good behavior and rewarding the bad. When your cat does what you want him to do — uses his scratching post, for example — you probably take it for granted. But as soon as he digs his claws into the sofa, you react, most likely by scolding him or shooing him away or interacting with him in some other way. This teaches your cat that scratching the sofa — not his scratching post — earns him your attention, so he keeps doing it. Help put a stop to unwanted behavior by flipping your response: Reward what your cat does right and ignore or redirect him when he does something you’d rather not see. Give your cat praise and petting when he uses his scratching post; when he claws the sofa, redirect him and reward him once he’s scratching in the right place. 3. Attempting to eliminate instinctive behaviors. Many behaviors humans find undesirable, like clawing, pouncing, jumping or climbing, are natural for a cat. Attempts to eliminate these behaviors can be highly stressful for your cat — and they almost never succeed. A better approach is to redirect these behaviors to spaces in your home where they are acceptable. Cat shelving, perches and trees are useful for felines who like to explore high places, while a box or laundry basket can offer a secure place for your cat to relax. Encourage your cat to explore these alternatives by luring him with treats, catnip, toys and petting. Reward him for following his instincts only in the designated areas.